I love your word. You and I are walking similar paths. I'm so sorry for the losses you have experienced in 2014 and hope 2015 will be a bit brighter. I love this word too. Wishing you much, much courage, and life's richest blessings in 2015! Beautiful, heartfelt, reflective and powerful writing,Karen! I love your word. I will continue to keep you in my daily thoughts and prayers. Dear Karen, I am so sorry to hear the news about your mom. I wish you courage, peace, and strength for 2015. Hugs!! 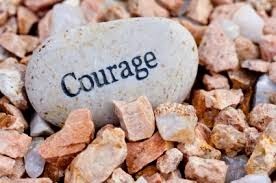 I am so glad courage has found you, I'm pretty sure it was there all along. Reading your stories of loss have shown us how strong you are, and yes, I imagine some days are meant for tears, naps and not much more, but writing is a soothing gift, thanks for sharing your gifts with me and all your readers. Perfect word for 2015! May it guide you one step at a time. This is a perfect word for a year of risk-taking, discovery, healing, growing, and changing. Hugs to you, dear friend.